I have a strange relationship with layering my clothes. There have been times in my life where I used layers of clothes to hide my body (thank God those days are over!). There have also been times that I felt layers made me look “bulky”. But here’s the thing, adding layers to what’s already in your closet is a quick and easy way to update your wardrobe as we transition into spring. 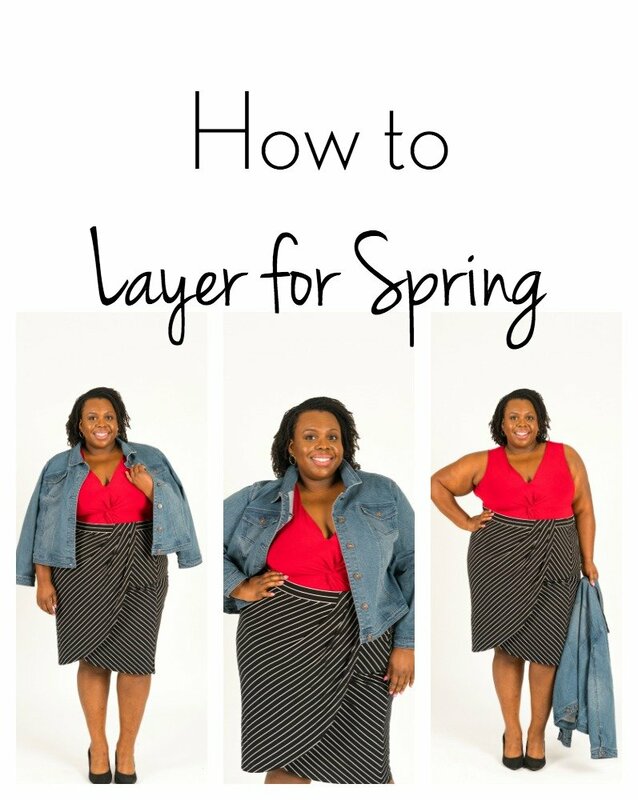 There are a few simple layering tricks I’ve learned along the way– can I share them with you? One of the most obvious things to layer is a sweater or cardigan, but If you’ve been following me for a while you know that I used to wear cardigans all the time. For me, cardigans weren’t a fashion choice they were a way to hide my arms and body. So when I made a body positive commitment to love my body at any size, cardigans had to go. I’ve stuck to that commitment but that doesn’t mean I’m out of options– it means I get to be more creative! One of the reasons I felt layers made me look bulky in the past is that I was always layering out/over my clothes (i.e. a blouse over trousers and then a sweater on top of the blouse) I’m learning now that tucking my blouse in and layering “under” my clothes can eliminate that bulky feeling. Sometimes a layered look can be as simple as tucking in your top (I’m wearing a Why Knot Top from Catherines) and draping a jacket or sweater over your shoulders. I love this denim jacket from Catherines because the denim is very supple (when denim jackets are stiff they don’t always stay on my shoulders). I’ve been adding pins and brooches to the jacket every time I wear it which gives it a more elevated look. I’ve seen some fashionistas that can rock pants + skirt + button down + sweater + jacket effortlessly. For me layering feels authentic when it’s minimal, three pieces at most. Like a bottom, top and overlay piece. When I’m laying for spring I like to mix in bold colors and subtle prints, that’s why I chose this Why Knot Top, Linear Wrap Skirt and Timeless Denim Jacket all from Catherines. Now is the perfect time to collect tank-and-cardi combos for spring. Catherines has an endless collection of plus size tops tees, shirts, tunics, jackets and more that fit comfortably and work with your wardrobe. To check out their tops here and their tops, jackets and cardigans, click here. Do you like to layer your clothes?